Tagua nuts are small (roughly 2″ long) seeds from palm trees in the Phytelephas genus. 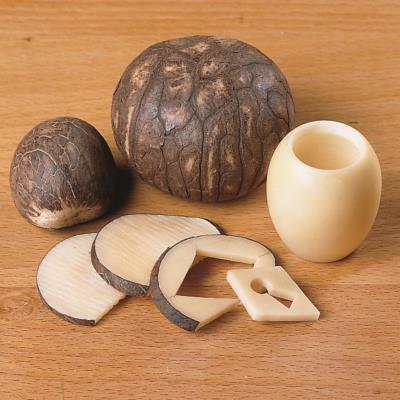 Beneath the thin, brown, flaky skin of the nuts lies a stark white tissue that closely resembles animal ivory: hence Tagua nuts are sometimes referred to as palm ivory. The average density of the “ivory” material is approximately 75 lbs/ft3 (1,200 kg/m3). 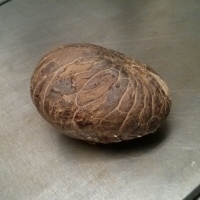 Although oily and non-porous, Tagua nuts can be glued to wood or each other using epoxy or CA glue. 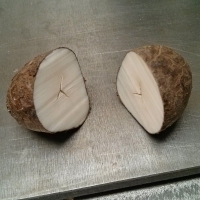 At the center of each nut lies a very small void (see image below). Because of their small size, Tagua nuts are typically only used for inlays, accents, and small carvings. I have had tagua glue joints fail with both epoxy and CA glue but not E6000. Oh ok. So they are wet proof as well? Do they need to be sealed?